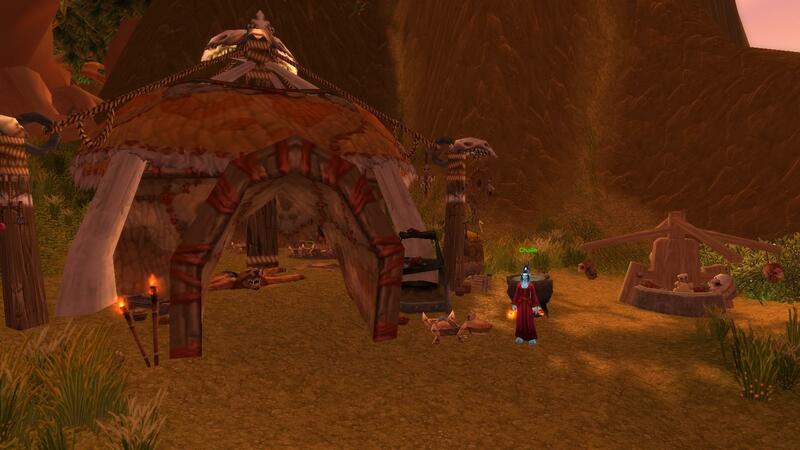 Episode #60 Timecapsule: A bizarre destination is hidden high in the hills of northern Nagrand. Found at coordinates (51,14), the Nagrand Orphanage is home to an NPC troll named Challe. Visitors to this remote vista will discover that Challe is watching over a great number of babies from both factions – orc, night elf, troll, and tauren. The camp is setup with a furnished troll house, large sandbox, and a unique circular-swing (currently occupied by riding tauren infants). A closer look at this cheery haven for children may reveal a darker underbelly… small bones scattered around the camp, a large cooking stew, and various cages containing tiny childlike skeletons inside.